GloFab Fiber Optic Lamps Look...Halfway Decent? When most of us think fiber optic lamps, we have visions of black plastic casing emitting rainbow effects through fiber optic tubes sticking out in pony tail fashion. 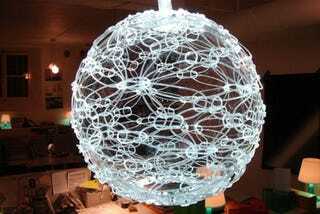 GloFab challenges the ugly fiber optic stereotype by weaving together what is almost a fiber optic fabric around a single light source, and shaping it into spheres or various custom fixtures. Staring at this ceiling fan that we've meant to replace for years, we're given more ideas, but sadly, not any addition motivation.